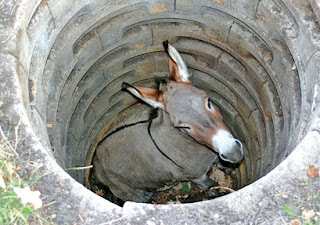 A farmer lost his Donkey when it dropped into a dry well. The donkey keep calling out to his owner for help. He and villagers tried to save the donkey up but its too deep to reach. Do not want his donkey to suffer from dying and dirtying the well, hence he thgt of filling up the well with soil to hasten donkey's death. Hence together they start digging up soil and filling up the dry well. The donkey knowing his fate, kept on crying while the digging continues above. After a long time, the donkey stopped his crying. The farmer and villagers were puzzled at why donkey stopped making noise. When they looked down , they were amazed at what they saw. The donkey was pushing aside the soil to the side and keep standing on top. donkey smartly jumped out of the well in front of all the villagers. Do not let the daily frustrations of life to hit us down. The situation may be very bad. Like the donkey, we can choose to throw aside the "soil"
Eventually problem will be solved. Hope this story can encourage all of us here.